Shaped by the carving of massive glaciers millions of years ago, Southeast Alaska is an astounding region of deep fjords, glaciers, majestic mountains and forests. Known as the 'panhandle', it epitomises classic Alaskan scenery. Thousands of islands form a pristine protected waterway called the Inside Passage that is lined with many charming towns and small villages rich in history. About half of the tourists who travel to Alaska arrive on cruise ships that wind their way through the islands of the Inside Passage to ports of call such as Ketchikan, Juneau, Sitka and Skagway. The area is home to the native cultures of the Tlingit, Haida and Tshimshian tribes; the art of totem pole carving, as well as traditional music and dance have been preserved, especially in Ketchikan. Russian settlers have also left their legacy of icons and onion-domed churches, having been drawn to the region in search of fur. The region's promise of gold, salmon fishing and forests of timber attracted many other profiteers. Today the business of tourism is an additional income-earner for many of the picturesque coastal communities. The history of the Gold Rush days is especially evident in the town of Skagway at the northern tip of the Inside Passage, once a lawless trading post serving the Klondike Gold Rush pioneers. Juneau is Alaska's attractive capital, with a bustling waterfront and a scenic mountain backdrop, and is the gateway to one of the country's most glorious regions, Glacier Bay National Park. 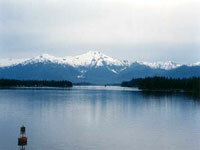 We are looking for contributors for our The Inside Passage travel guide. If you are a local, a regular traveller to The Inside Passage or a travel professional with time to contribute and answer occasional forum questions, please contact us.